homelessness move toward greater housing stability. It is important to note that these are not steps or stops along a continuum, but rather a spectrum of options available to those in-need as their circumstances dictate. These circumstances can fluctuate as life changes, which is why having a range of approaches that are integrated into one system is an important aspect of successful intervention. The Provincial Homelessness Initiative provides housing with integrated supports to people who are homeless or at risk of homelessness. Some PHI developments provide additional supports for clients with mental health and/or addictions issues. Under this initiative, the Province works in partnership with local communities, the federal government, and non-profit providers to develop new housing options with integrated support services. The Homeless Prevention Program is aimed at providing people in identified at-risk groups facing homelessness with portable rent supplements to help them access rental housing in the private market. The program assists youth transitioning out of foster care, women who have experienced violence or are at-risk of violence, people leaving the correctional and hospital systems, and individuals of Aboriginal descent. 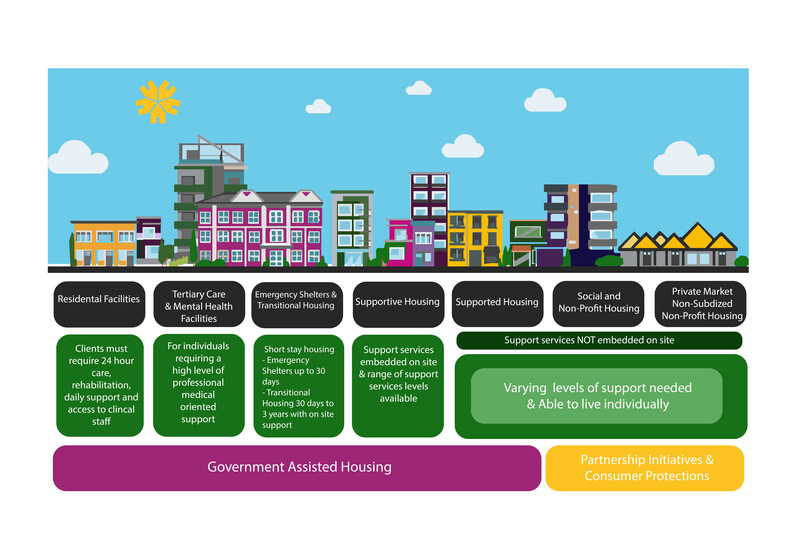 Support services are provided to ensure enhanced access to housing and community-based services. The program operates, in many instances, as an enhancement to the existing provincially-funded Homeless Outreach Program/Aboriginal Homeless Outreach Program. The Homeless Prevention Fund is an initiative by the Greater Victoria Coalition to End Homelessness and ten partners that provides emergency assistance to individuals and families in Greater Victoria who are in financial threat of losing their housing. Grants are used to pay rent, utility bills or damage deposits, and the maximum available amount is $450. With the generosity of private donors, the fund was established at the Victoria Foundation in January 2011. Recipients have to demonstrate that they have exhausted all other means of help and have a plan for paying rent next month. They do not have to repay the money, but can only apply once a year. To ensure the best possible service, please mention you are interested in the Homelessness Prevention Fund when you contact these agencies. Rent Supplements are BC Housing or Island Health income subsidies to clients of community-based support services programs to secure a rental units that would otherwise be unaffordable. These units can be either in the private rental market, or in non-profit operated rental housing where there is no direct subsidy. While the primary use of a rent supplement is to pay a portion of the client’s rent, it may also be used for a damage deposit, utility deposits, moving costs, start-up household expenses, and similar expenses to enable a client to secure and maintain housing. The Streets to Homes pilot was a collaborative effort on the part of the Coalition and eight partner organizations. As of January 1, 2012, the pilot was proved successful and the program was officially transferred to the Pacifica Housing Society. S2H uses the “Housing First with Supports” model to move individuals experiencing cyclical homelessness directly into housing in the private market through a comprehensive landlord support system. The program secures housing, integrates services, and improves coordination to effectively deliver services to people with mental health and substance use issues who are experiencing homelessness. For more information or to apply, contact Pacifica Housing and call 250-385-2131.